Please help us raise the funds to print Subhuti’s Mind in Harmony. We’ve got one month to go! 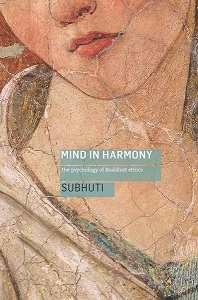 There’s less than a month to go until the release of Subhuti’s new book, Mind in Harmony: A Psychology of Buddhist Ethics, due to be available for sale in both paperback and eBook format on 16th March. But we still need to raise just over £1,800 to make this happen! Please consider donating to our campaign today – if you give £30 or more, we will send you a copy of Mind in Harmony on its publication, along with a link to download the eBook. You will also be giving many other people the opportunity to read Subhuti’s book, and benefit from the Buddha’s teachings.